This past weekend I headed over to one of our many local farmer's markets, with my mom. I had recently had a friend ask for one dozen regular sized chocolate cupcakes with strawberry buttercream frosting, and topped with fresh chocolate covered strawberries, so I figured now was just as good of a time as any to head over and pick up some local goodies. Don't worry, I'll post later this week about those cupcakes- they came out so darn cute! The weather was perfect, to say the least. It was such a beautiful Saturday- sunny and slightly warm, very very small breezes every now and then...such an uplifting change to how it was a few weeks ago (and how it is today!..It's grey and freezing!!) I know myself pretty well, so although I was going "only for some fresh organic strawberries..." I knew to bring a large bag..."just in case". Boy am I glad I did! There were so many wonderful things! These strawberries I found were the most beautiful color red and were so totally sweet and juicy I couldn't pass them up! Once I got home, they completely filled my house with that fragrant fresh strawberry scent! Good thing too- they'll be used in both the fresh sweet cream buttercream frosting and as chocolate dipped decorations on top! Before I left I texted my husband (who had to work that day :( ) and asked if there was anything he wanted me to pick up. "Anything beefy!" is the answer I received.....haha. As I walked by this vendor my eyes immediately were drawn to the "local", "grass fed", and "free range" signs posted all around...then I saw it- Grassfed Beef Jerky.....oh my goodness! That is just what my husband needs, and is very beefy! 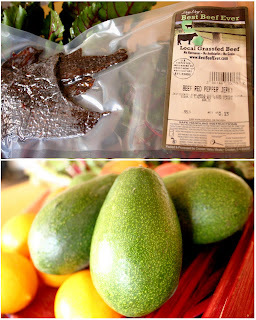 These "Organic Bacon Avocados" (yes...BACON avocados) from Thy's Ranch in Fallbrook California also sang to me. We love avocados- a wonderful source of good fats for your body! I am the most excited about this!!!! Organic unsalted (the best kind for baking!!) fresh made BUTTER! Although my mom and I stopped to sample this man's cheese curd (which was also amazing, by the way) it was his fresh butter I seriously could not not purchase! I cannot wait to try this!! Being the completely obsessed food lover that I am, I have about 4 different food inspired magazines coming to my house each month, along with my daily emails I receive and blogs I read. I came across a very interesting recipe for roasted beets and thought to myself, "I should really try this..." I hate beets. Hate. I'm very passionate about this hate. But they are so incredibly good for you, that I really want to like them. Maybe this will change my opinion. 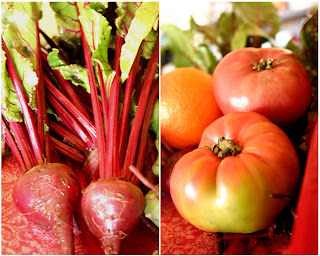 ;) I also found some beautiful heirloom tomatoes...mmmmMmmm! Enough said. I must be in some sort of citrus mood right now (or at least I really really was the day of the farmer's market) because not only did I buy some beautiful (and so fragrant!) 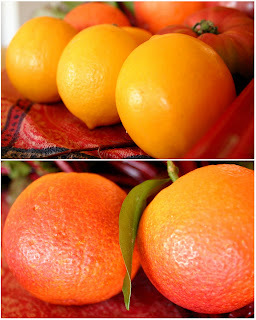 organic Meyer lemons, but I also purchased some blood oranges for my husband and I to eat! I love blood oranges...if you haven't had, seen, or even heard about them- please please google them. They're so gorgeous when cut! Deep red with speckles of orange throughout- so very juicy! Tart and sweet at the same time. They're just plain delicious. They make an awesome blood orange vinaigrette too!! Try them!